Through the Cleveland A. Wright Lecture Series, community lectures are intended to contribute to a culture of excellence in the region. Featuring expert speakers or panels, the series exposes outside thought leaders and sector influencers to Southside organizations and benefits regional nonprofits, civic leaders and funders. At the same time that the Foundation continues to offer the Cleveland A. Wright Award for Outstanding Community Service, this offering is intended to yield a broader community benefit beyond that single, annual award. During the Foundation’s 14th Anniversary Celebration, Atherton’s lecture underscored the integral connections between the built environment, public health and health equity. Emiko Atherton is the Director of the National Complete Streets Coalition, a program of Smart Growth America, as well as Vice President of Thriving Communities for the organization. Prior to joining Smart Growth America, Atherton was Chief of Staff for a King County Councilmember in Washington State, where she had a role in the creation of the Puget Sound Regional Council’s long-term transportation plan the development of pedestrian and bicycle connections to Sound Transit’s line rail stations in underserved communities the integration of public health goals into the region’s transportation and land use plan; and, the process to work with diverse stakeholders to include equity goals into King County’s strategic plan for transportation. She draws from her expertise in transportation policy, public health, land use, economic development and legislation to consult with communities across the country on how to create better transportation networks. 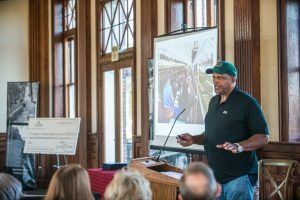 During the Foundation’s 14th Anniversary Celebration, Atherton’s lecture underscored the integral connections between the built environment, public health and health equity. David Dodson shared some of MDC’s findings on youth and workforce development during the Foundation’s 13th Anniversary Celebration, making the data relevant to the Petersburg area communities. David Dodson is president of MDC, an institution focused on helping people and communities out of poverty. Since joining MDC in 1987, he has directed major projects to increase student success in public schools and community colleges, address regional economic decline, strengthen community philanthropy, and build multiracial leadership across the South and the nation. He has coauthored numerous publications on these topics. He has led MDC’s work in developing “Passing Gear Philanthropy” strategies to address poverty and reduce social disparities, helping Southern foundations redirect more than $1 billion in philanthropic assets to address structural barriers to progress and equity for the people and places they serve. During his visit to Petersburg, Mr. Dodson met with a cross-section of community stakeholders working in youth and workforce development to gain insight into some of the local challenges they encounter when trying to bring about upward economic mobility for disaffected youth. He then presented findings from MDC’s own research on this topic during the Foundation’s annual meeting in October. Rick Lowe lectured at The Cameron Foundation’s 12th Anniversary Celebration, held at Union Train Station in Petersburg, VA. Originally trained as a painter, Lowe shifted his work in the early 1990s to address some of the pressing social, economic and cultural needs of his community in Houston. He is best known for his work to organize the purchase and restoration of a block and a half of derelict properties in his neighborhood and to turn them into Project Row Houses (PRH) in 1993. The organization has since become a vital anchor for the neighborhood, and Lowe has undertaken a number of other community-based revitalization projects across the country and internationally. During his visit to Petersburg, Lowe toured neighborhoods and met with a number of local stakeholders to gain a deeper understanding of the challenges in revitalizing neighborhoods in the community. His lecture was featured at the Foundation’s annual ceremony in October. Will Allen was The Cameron Foundation’s inaugural Cleveland A. Wright Lecturer in 2015. In 2015, The Cameron Foundation launched its inaugural Cleveland A. Wright Lecture by hosting Will Allen as a guest speaker during the Foundation’s annual ceremony. Allen, farmer and founder and CEO of Growing Power Inc., is recognized as a preeminent practitioner of urban agriculture, providing training and building community food security systems, in America and throughout the world. He is a past recipient of a John D. and Katherine T. McArthur Foundation McArthur Fellowship and also was named one of the 100 World’s Most Influential People by Time magazine in 2010. Over the course of two days, Allen met with community leaders and toured the local Petersburg area to learn more about some of the barriers for people living in local food deserts. During his speech, he then discussed models that other communities are employing to overcome similar challenges by increasing food production and improving access to healthy foods.